Coal is a dark brown or black-colored fuel that can be used instead of, or in combination with, wood in a heat-producing stove. An advantage of coal is that it burns hotter and longer than wood. Coal is a nonrenewable energy source, however, due to the extended time it takes to form. Burning coal in a stove for heat isn't as popular as it was in the past, but many people still use it. Choose a spot in your basement to store a supply of coal to be used for home heating during the winter months, if your coal-burning stove is located there. Because it's nonporous, coal doesn't need to be stored inside to be protected from the elements. Still, you'll want the coal to be stored as close to the stove as possible to make less work for yourself. Pick a suitable space outside, either in the yard, or in a garage, shed, or other outbuilding, to put the coal if you don't want to keep it indoors. According to the Fireplace Supplier Register, coal can be stored in damp places without harming it. It can also be retained in areas that have little or no protection from the rain and snow. 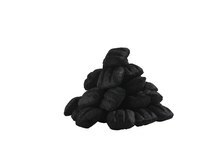 If you choose, so you don't have to handle wet coal, you can cover it outside with tarps to keep it dry. Store bagged coal inside the bags until you're ready to use it. It will be easier to store it and carry it to the stove. Coal either comes by the bag or by the truckload (if you order several tons). Loose coal is easier to contain if it's stored in wooden bins, but it's not necessary. Storing coal isn't that messy. There will be small pieces that break off from being handled, but it's not a dusty source of home heating. If you're concerned about black mess from coal on the floor, place a piece of heavy plastic down before it's delivered. How Do I Build a Home Coal Storage Unit? Can I Insert a Wood Pellet Stove Into My Gas Fireplace? What Woods Are Safe to Burn in Fireplaces? How Far Above the Roof Peak for a Stove Pipe?